With Valentine’s day around the corner I decided to make a cute little set of coasters to brighten up my coffee table! After I made my first set and posted a photo on Facebook… little did I know that all of my friends would want a set as well! so you can make them for your friends (and yourself!) as well. They really do make a sweet Valentine’s gift! These guys are super easy to make, thanks to CRAF-TEX Precut Coasters. 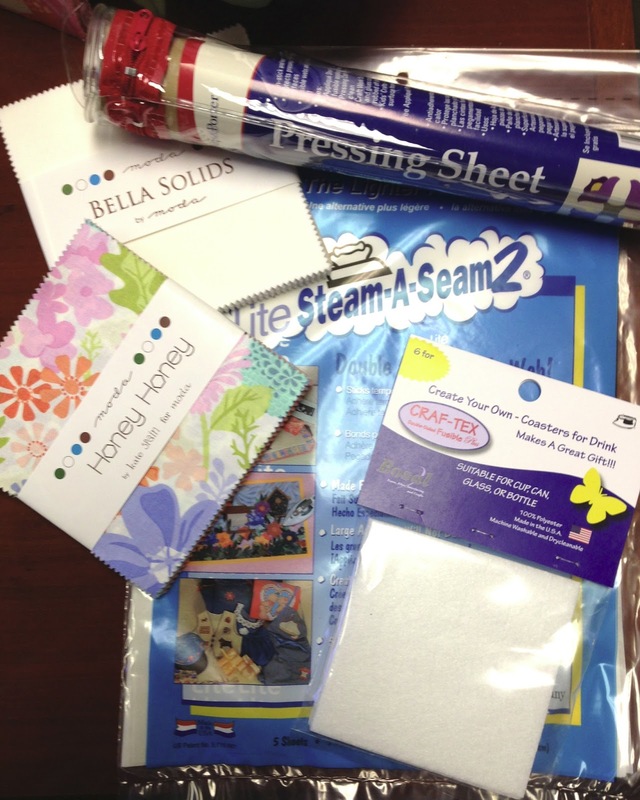 CRAFT-TEX is a heavyweight double-sided fusible stabilizer. What does that mean, you may be asking? Below you will find my supply list and step-by-step instructions. You can find the supplies for this project at your local quilt shop. Bosal CRAF-TEX Coaster Pack– each pack has 6 – 4″x4″ coasters in it. Fabric Scissors– My preferred scissors still remain the Elan scissors. You will want a large pair to cut out the large shapes and a small pair to cut the tiny pieces- like inside the letters and intricate shapes. 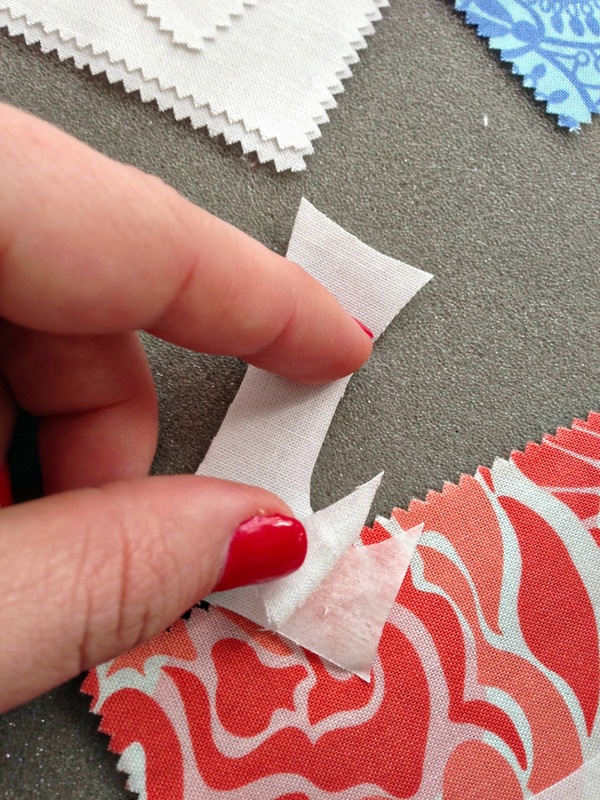 It is so important to use fabric scissors or your fabric will fray on the edges leaving it looking frazzled. Ironing Board. 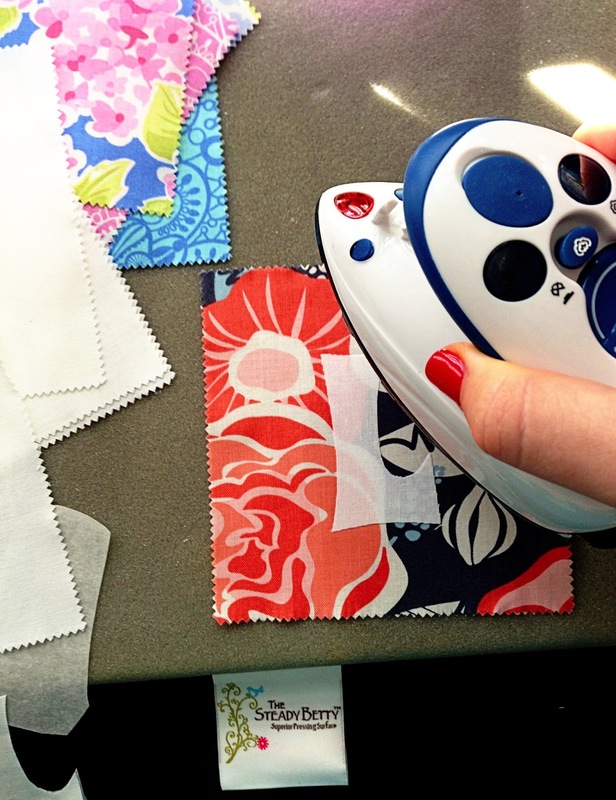 I really enjoy my Steady Betty pressing mat because it is so small and I can sit it right by my sewing machine and move it anywhere I need… and it is also great for taking to classes. Ball Point Pens– to draw/trace designs onto Steam-a-Seam. 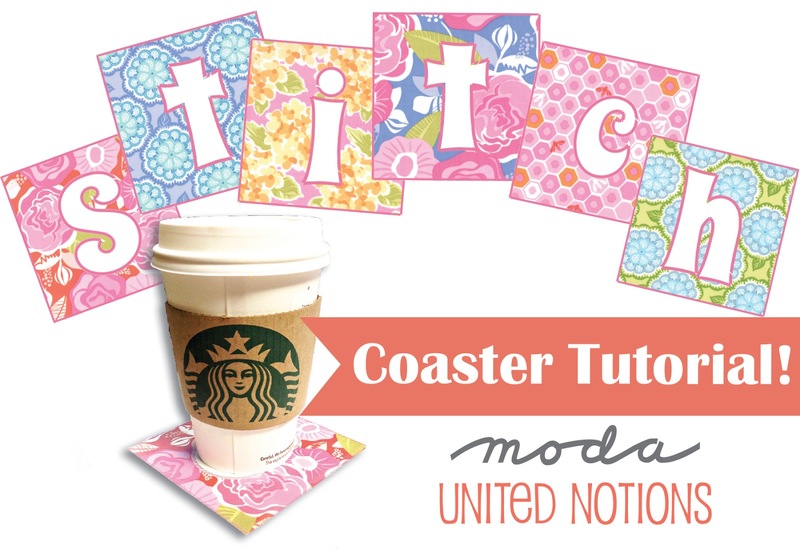 Design/Templates– Choose a word or design you would like to use on your coasters. I am including a Free PDF of the alphabet I used here. Otherwise you can just type out your letters in a Word Document and print them off. Choose your background fabrics as well as the fabric for your letters or designs. and a white Bella Solid for my letters. chose the fabric for the back side as well. NOTE: Your design must be traced or drawn backwards (mirror image) onto the SteamASeam so when you transfer to the WRONG side of the fabric and eventually cut it out it will come out the correct direction. To achieve this you can draw it with a sharpie on a separate paper and then flip that paper over and lay under the SteamASeam to trace backwards. •CUT design out of STEAM-A-SEAM leaving about 1/4″ – 1/2″ around the design. 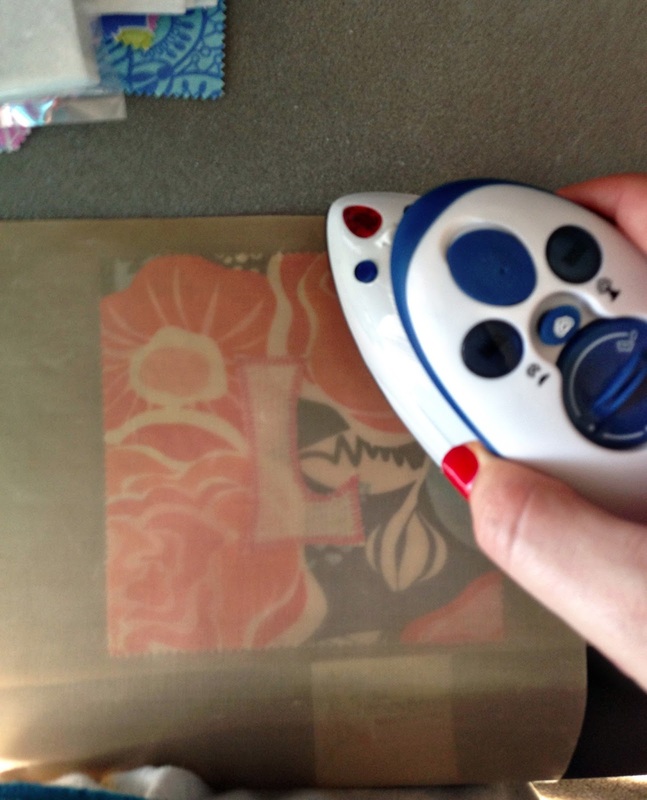 •PEAL the smooth side of the SteamASeam away and then lay your Applique Pressing Sheet over the fabric and letter and then press the Sticky Side of the design onto the WRONG side of your fabric and press for ~10 seconds to get the stickum to adhere to the fabric. •TEST by using your finger nail to pull back a corner of the SteamASeam to see if the stickum has transfered from the Paper to the Fabric. If not, press a bit more but not too long. •CUT the DESIGN out exactly on the line you drew. 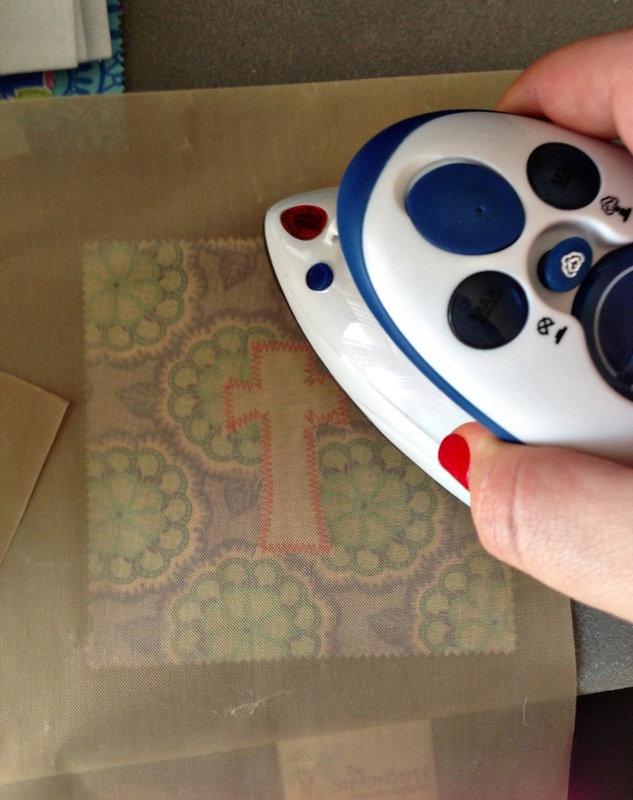 •PEAL back the SteamASeam paper from the fabric leaving the stickum on the WRONG side of your fabric. 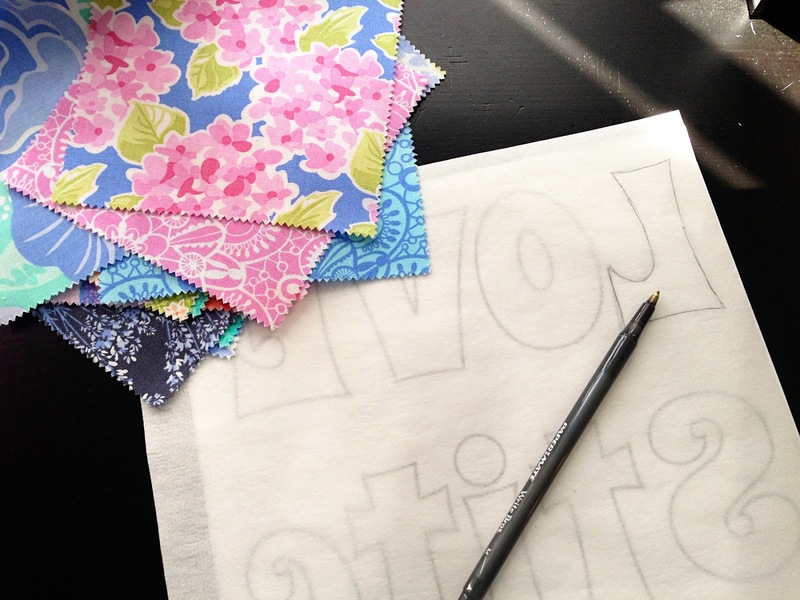 •POSITION your letter/design where you like on your fabric. •PRESS- Once you have it exactly where you like, press that baby down! I decided to make my coasters double sided. The top side to say “Stitch” and the bottom side to say “LOVE” with two hearts on either side. and then I was ready to make my coaster! 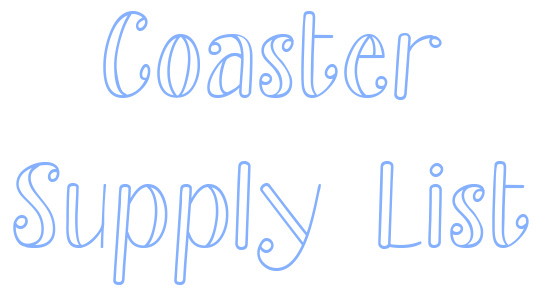 •Grab 1 of your CRAF-TEX Coaster Stabilizers and your top and bottom fabrics. 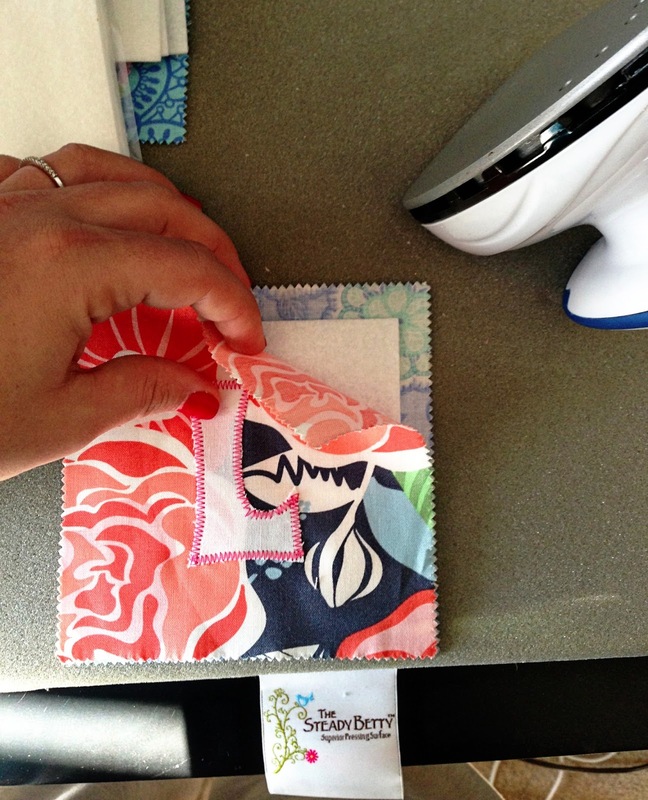 Then sandwich your fabrics around your CRAF-TEX Coaster. 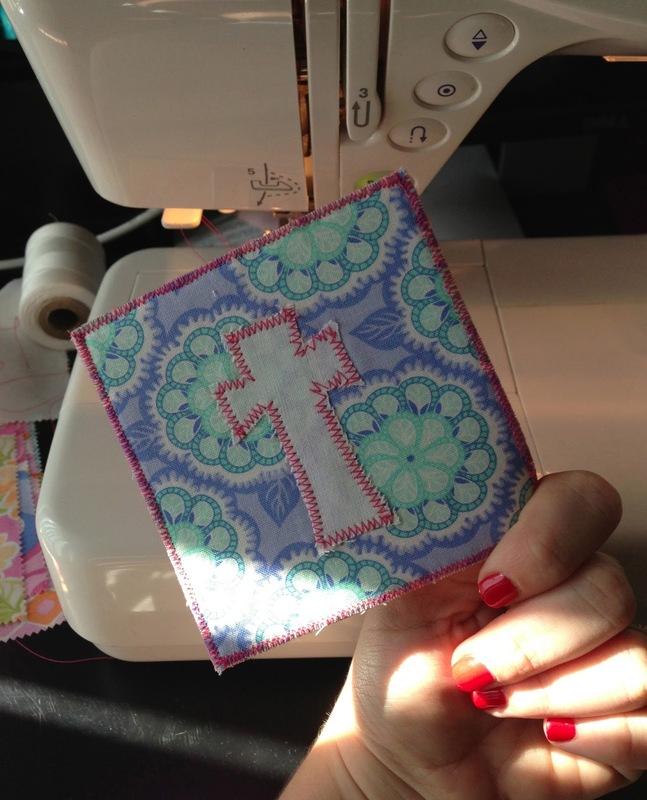 Since your charm squares are 5″x5″ and your coaster is 4″x 4″, you will have some fabric around the edges of the coaster. I just centered my coaster in the middle of the fabrics so the letters would be centered on the coaster once trimmed. 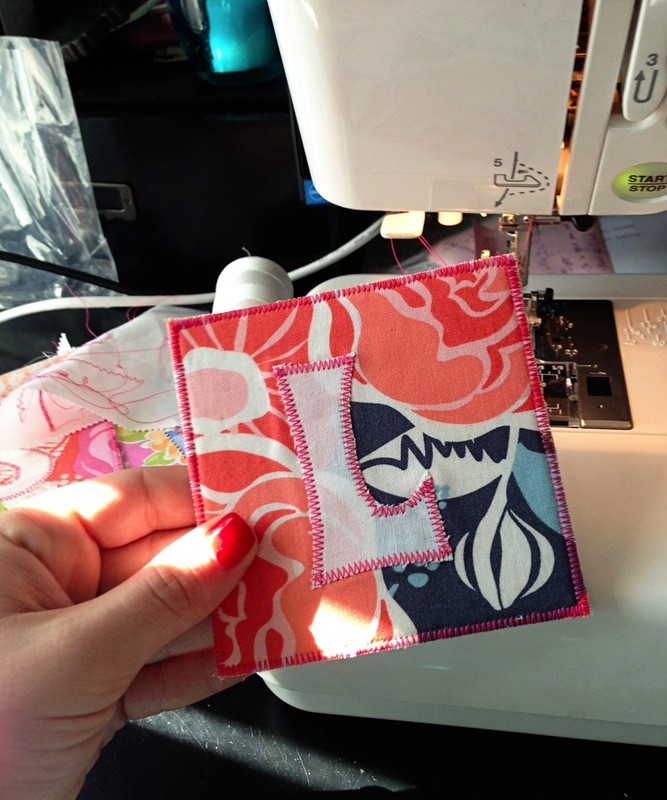 Your letters/designs should show on the outside and you will no longer see the CRAF-TEX. 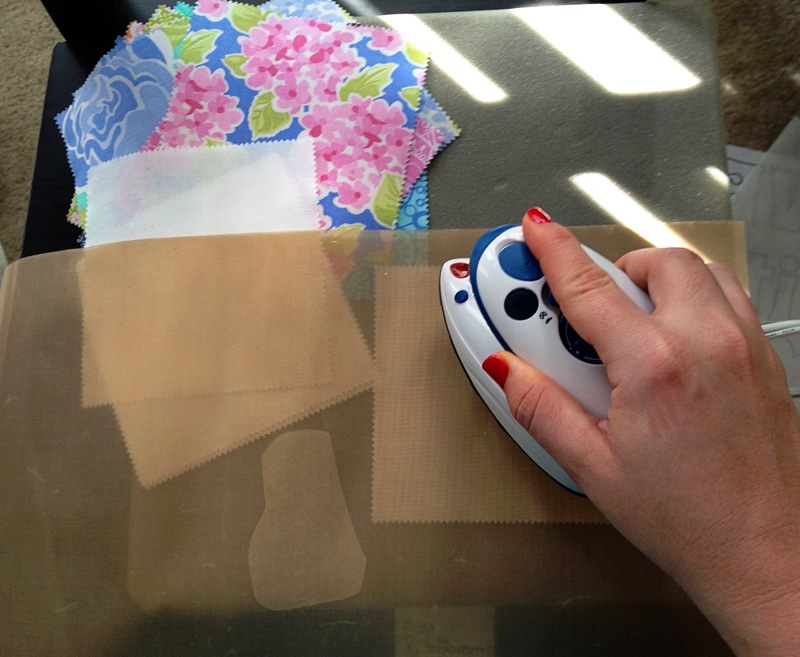 •Cover your fabric sandwich with the Applique Pressing Sheet and press down the top fabric for about 30 seconds. Then flip your fabric sandwich over and press the opposite side for 30 seconds as well. •ALMOST DONE!!! Your final step is to stitch around the edges of the coaster to finish it. Again I used the zig zag stitch. A satin stitch or button hold stitch would also look great. Just leave a comment telling me who you would make these coasters for and why they deserve them. 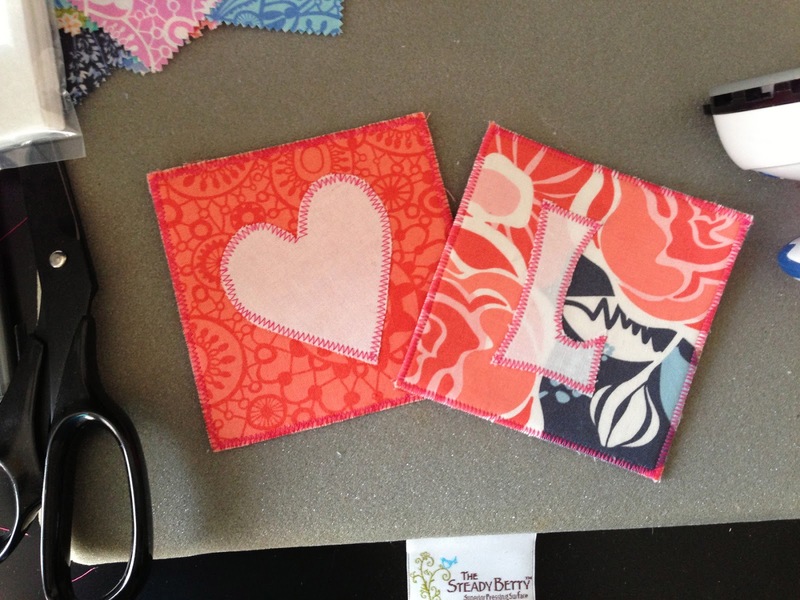 I would make these coasters for a friend for a hostess gift…I just LOVE the Honey Honey fabric line! I think she would enjoy Kate Spain, too, and she deserves them for all she does for me! I would make these for my darling husband of 25 years! Just might make them for myself! On the other hand, I think they might wind up with a friend who has just come home from surgery. Her visitors could enjoy a cool drink and a place to set it! These are so cute and I would make them for my daughter. She loves this kind of stuff and hasn’t had time lately to sit and sew herself. I would make these for LOTS of people! In fact, I am going to make them for my Christmas box. What a cute idea! The first set goes to the ranch owners and I think I’m going to use old Wranglers – heaven knows I’ve got lots of those! Thank you for such a great gift idea! I would love to make a set of coasters for my daughter since she just bought her first home. I would make coasters for both of my daughters-in-law and a set for my mom. You are NEVER to old to get a Valentine’s gift! These look like a great quick project. Thank you for the pdf of letters too. I would make some first for my husband. He does so much for me and deserves to be spoiled as much as I can. I think making a set for my Stepmom would be a great idea too. She just had open heart surgery yesterday and will be recovering for awhile from that so I’m sure some new coasters to brighten her day would be welcomed. Thank you for the great tutorial and idea. I love this project!! Thanks for the letters! I would make them for my son and daughter-in-law who live overseas serving our country. Thank you for your tutorial. And because each of them does so much for me. They are always available to babysit my 2 sweet boys! Would love to make a set for my dear friend, Laura. I would make these coasters for my Mom. She begged me to sew when I was younger and I refused. Now, I sew and I love it and I love sharing things I make with her! It’s brought our relationship to a whole new level! I would make a set for my siste-in-law who’s birthday is Feb. 14! This would be a sweet and usable gift for sure. Thank you for this lovely pattern. think they would make a cute gift for the switchers in my sewing class. these would make great favors for the quilt retreat i run. Very nice. My daughter could use a little cheering up so I would make this set for her! Oh, my daughter for sure! She is never without a cup of coffee or tea and these would just be an adorable gift for her~~~ Thanks for the chance to win this beautiful prize!! I would donate these for my guild after I had the fun of making them first! It would be put in our show auction to help raise money for the local scholarship we give. A good friend, who frequently invites me for supper. Would be great for her kitchen breakfast bar, where a couple friends and I sit while she cooks. Since my 26th wedding anniversary is February 14, I would make them for my husband and me to enjoy. If I were fortunate enough to win this kit, I would love to make the coasters as a get well gift for my cousin who has been in the hospital for over a month. This is a great tutorial! I would love to win this coaster set! I would make it for my friend in OR who it going through a very hard time right now. Her partner has cancer, and is going through treatment, and it is really hard for her. This might cheer her up just a little. What a great tutorial, cant wait to try! I would make them for my mother. She deserves them because she flew me over from Australia to Michigan to spend some much needed mother-daughter time with her for three months. Isn’t she great?! What a cute idea! I didn’t know about the Craf-tex coaster packs! I would make some for the girls at work, and for my friends at the quilt shop. And for ME! I would make these for my friend Naomi. She’s always making coasters for other people – it would be nice to surprise her with a set she doesn’t have to make herself! WHAT is that tiny little iron!? I want one! I would make them with my friend, Patience, as she helps me with many things I just can’t grasp on how to do them, sewing, quilting and others. She cares for her 85 yr old mom and works part-time, yet she still finds time to help me understand how to do my sewing and quilting. She definitely lives up to her name, Patience! 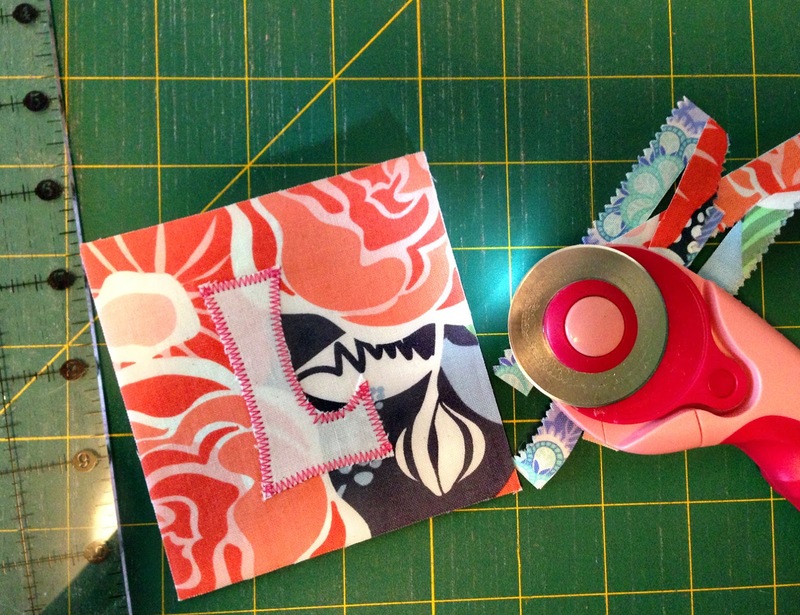 I would make the coasters for my quilting friends in Florida where glasses really sweat! Great idea! I would like to make some of those for my new friends in the stitching group I have joined. I think they would like that I thought of them. I would make the coasters for a coworker who is always there for me. ill make them for my dgd’s hope chest … she’s marttying in april and i’m making her a table and kitchen set. I would make these for my daughter who just bought her first house! I would make these for my sister-in-law and brother. They are re-doing their living room and need something to protect their furniture! She would LOVE this fabric! I would probably make them my middle daughter, who is going through a tough time at the moment and needs cheering up. She currently lives at the other end of the country from us so these coasters would not be to expensive to post to her. I’d love to make a set for my big sis, my friend with a February birthday, and one for me! I make lots of stuff to give away and not enough to deck my own house! I would make them for my “Honey Honey” since we live in Bella Vista ! Both of these fabrics are both perfect for us. I will be making these for my daughter,it will be her fist Valintine’s Day sense her divorce. I wanted to do something nice for her. Thanks for the pattern and the chance to win. I would make these for my 89 year old mother to use for her bridge club as she always uses coasters and would love that I made them for her! I’d make them for my daughter and son-in-law. They both work so hard and could really use some cute coasters. I help my mom run a quilt retreat – these would be great gifts to each participant on retreat! I would make these for my sister, who is also my best friend ever, just because I love her. I’d make them for my family, because maybe then they’d use them! LOL! I would make them for my friend Sandy, who is always so thoughtful with her unexpected gifts. She deserves some new coasters! I would make these coasters for my mother. She loves bright colors and this group is such a happy one. She likes to entertains her friends and I think these would cheer up her house. I would make at least 3 sets, one for each of my daughters(they entertain regularly) and my other daughter as a thank you for organizing my sewing room and fabric. I would make these for my daughter Nicole who at 24 just got the most amazing job at Darmouth College and has moved far away from home for the first time. Decorating her first apartment so far from home I am sure coasters are the last thing on her mind. What a great idea! And it looks like one could make a set in a reasonable length of time. I would make some for my adult daughters so they have something to remember me by. I really cherish needlework done by my mother. Thanks for the giveaway opportunity. I would make these coasters for my sweet daughter. She has had a really rough year and I love her more than words can say. i know she and her room mates would love them. She deserves them because she is not only my daughter, but also my best friend. I would make them for my husband who currently leaves little coffee rings on surfaces all over the house. We don’t much like the glass or metal ones currently in use due to their tendency to stick to cups and then drop off damaging furniture. I would make these for my grandaughter. She is such a happy cheery girl these would make her room cheery too. I would pass them out to coworkers. I’d make them for the hospice where my brother is being cared for in his final days. They’ve gone above & beyond, and it would be nice to give back. Thanks for the chance. I would make these coasters for myself because I’ve spent the last 2 weeks painting walls, woodwork and baseboards and I need a treat! I would make them for my BFF. She is always doing for others and rarely for herself. She is just learning to sew and just converted one of her spare rooms into a sewing room. These would look awesome hanging in her room. My sister loves coasters so they would be for he. I would make them for a friend in either Hello Kitty fabric or sock monkey! Theses are wnderful! I would love to make some for my daughter in law who is expecting a baby in March. These would be so handy to have near her for when she’s holding the baby. I would make some for my BF Diana..she has a great Heart! I would love to make these for each of my 10 mini group girlfriends as a surprise when we go on our 4 day quilt retreat in Feb. This group is the best for laughing and living life! I would love to make these for my favorite pips…daughter, sister, sister-in-law for Valentine’s Day. They are adorable, love this idea! Would love to make these for my favorite pips for Valentines Day! Love this idea…simply adorable. Oh these are so cute! Thanks for the great tutorial! I would make these for my aunt I think, who has just moved houses into a remote community to teach there. I think she could use some new prettiness in her house! WHOLE lot of fun going on, Sarah Beth! Great stuff! 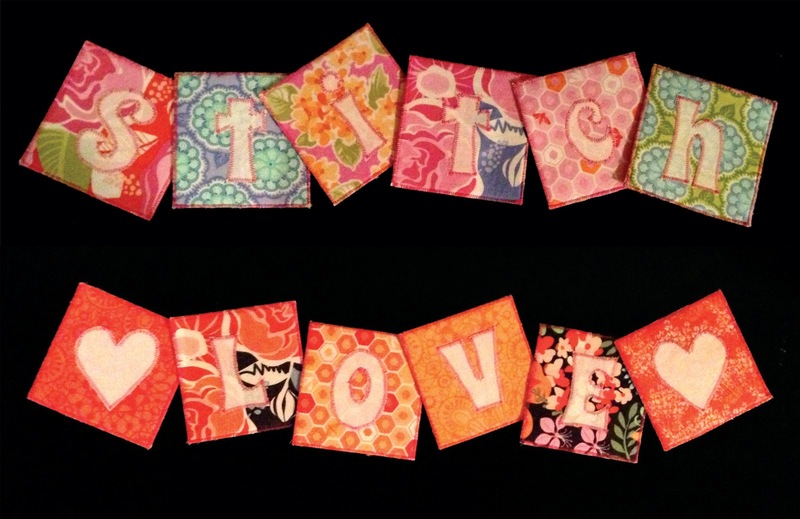 Love what you’ve done here … and of course we all love Moda’s Cutting Table! Exciting giveaway, too (which I am officially not entering). I’d give a set to each of my quilty friends! These are so cute! I would make them for my husband, because he is fast and furiously redesigning our table tops with ring motifs!!! My mom would love a set of these. They are so cute. I would love to make these for the girls I work with. They make me smile when I walk in the door and make work fun! I would love to make these to give as a thank you gift when my friends have me over for dinner. The coasters are really cute! Super cute! Thanks for the chance to win. I would make these coasters for my mom! She has coasters all over her home and loves handmade ones. That I made them for her would be an added bonus! I would make these for my Mom and Dad for Valentine’s Day! What a fun spring set of coasters for their family room! interesting product. I’d make some for our guild friends. I would make these for my mother! She is the one that taught me how to quilt, so I love to make quilted items to give to her. I’d be totally selfish and make them for myself. We use coasters all the time but not quilted ones (doesn’t seem right does it?) so I would love to make these to use in my own home. My furniture would love it. We don’t actually have any coasters now I think about it… so I would make them for my house! I would make them for my friend who has just started quilting. She needs some quilty bling for her home. Love the Honey Honey fabric. I will make them for each of my co-workers, because they filled in for me when I had knee surgery. I’d make these for my mom, because she’s always doing something for someone!